A knock-out competition was introduced in the 1977-78 season to run alongside the Silver King League. It was re-named the John Robinson Knockout Cup following the death of Mr. Robinson in 2006, as a mark of respect to a great servant of the game, both locally and nationally. His legacy still continues through the John Robinson Youth Chess Trust as John left substantial bequests to the British Chess Federation. 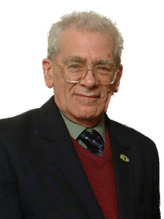 John Marshman Robinson was born in 1931 in Kettering and attended Kettering Grammar School and Birmingham University where he achieved a first class degree specialising in metallurgy. Following National Service in the REME he joined Stewarts & Lloyds, Corby in the research department where he was rewarded with the post as a senior manager in the field of research metallurgy. Following early retirement he became increasingly interested in the game of chess. Having been directly involved in Northamptonshire he was then invited to become an arbiter on the national chess circuit. He assisted in the organisation of international chess championships and was appointed to the prestigious official position of FIDE arbiter and called upon to oversee matches and tournaments in The Isle of Man, Moscow, Armenia, Istanbul etc. John became an important part of British Chess and took the entries for the British Championship for some years. His work on the laws of the game in the mid 1990’s has left its mark – being incorporated in the laws in present day use. Rewards came in the form of the prestigious Boxall Salver for his work and the BCF President’s Award for Services to Chess in 2005. Kettering "B" team are the current holders of the trophy having defeated Chess mates "A" team in the 2017 – 2018 final.